A new study concludes that acupuncture reduces the frequency and intensity of postoperative nausea and vomiting following laparoscopic surgery. 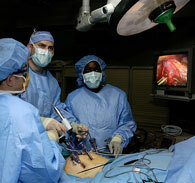 This type of surgery uses a fiber optic instrument inserted through the abdominal wall to view the internal aspects of the abdomen and its organs. A problem encountered by surgeons is postoperative nausea and vomiting caused, in part, by general anesthesia. The researchers applied electro-acupuncture to an acupuncture point located on the wrist region to patients during the surgical procedure. The acupuncture point, P6, has been used in Traditional Chinese Medicine (TCM) for the treatment of nausea and vomiting for over 1,000 years. This modern study confirms this ancient medical principle. The researchers conclude that electroacupuncture effectively reduces the “incidence and the severity of postoperative nausea and vomiting” for patients receiving general anesthesia during laparoscopic surgery.